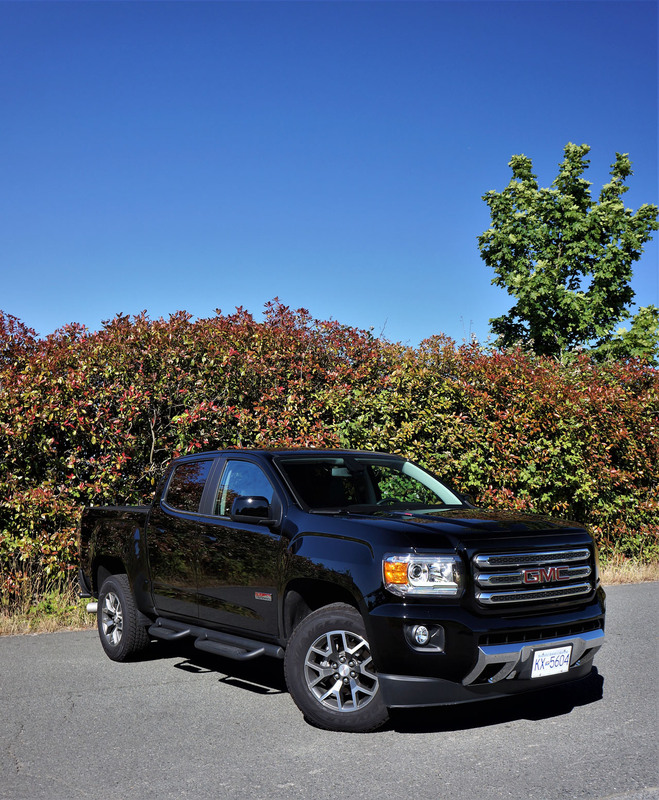 Thanks to General Motors, the mid-size pickup truck market is once again starting to heat up. 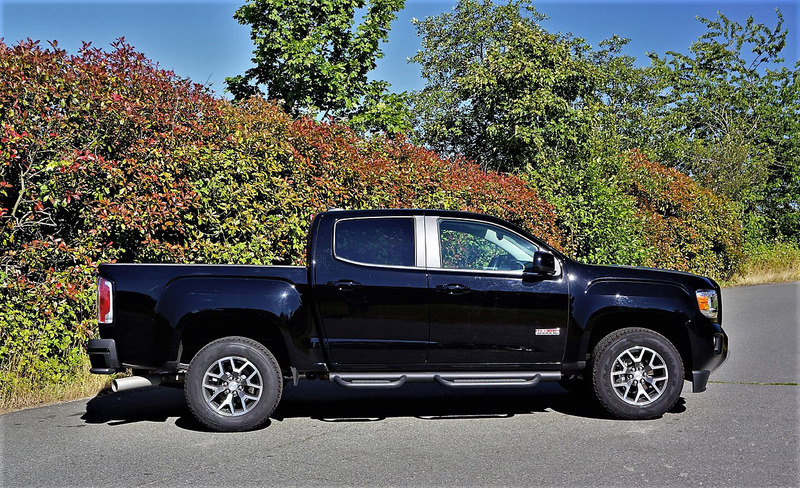 Toyota was hardly contested in this market for far too long, but GM reintroduced its Chevrolet Colorado and GMC Canyon twins in 2015 and has steadily been gaining back market share ever since. 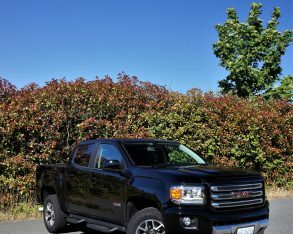 In fact, after just a year of availability the two trucks combined for 12,652 sales, and by so doing snuck right past the Tacoma’s 12,618. 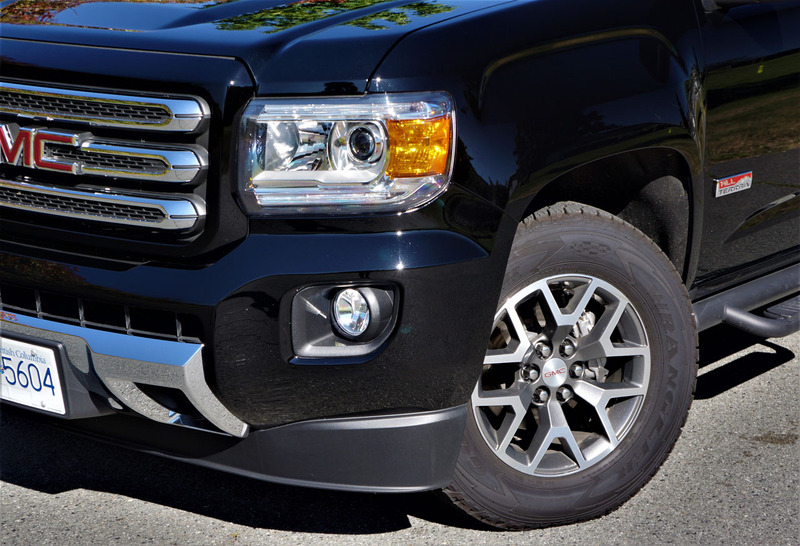 That gap widened in 2017 with 14,320 GM mid-size truck deliveries and just 12,454 for Toyota, while as of September 30 this year the General managed to sell 12,702 Colorados and Canyons compared to Toyota’s tally of 10,703 Tacomas, so as long as the final quarter of 2018 follows suit it should be another banner year for these two domestic pickups. 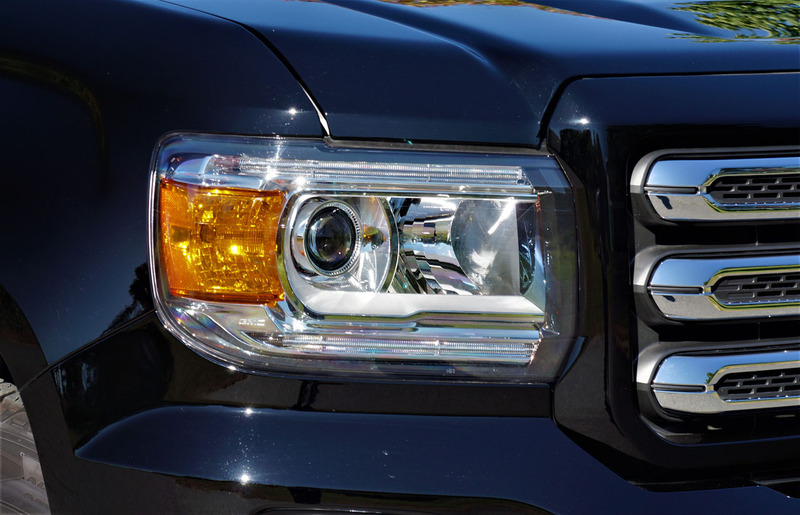 Just in case you forgot (as most people did), Honda and Nissan sell trucks in this segment too. 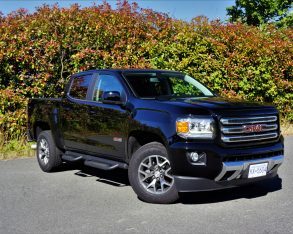 Still, despite an impressive second-generation Ridgeline the motorcycle company that initially started out selling a pickup truck was only able to lure in 3,169 new buyers over the same nine months of 2018, while Nissan, one of the originators of the compact pickup category, could only rally 3,071 of its faithful troops around its Frontier. 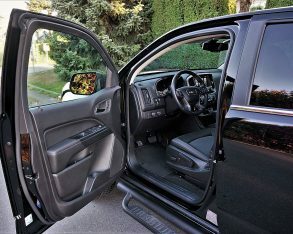 Nissan hasn’t redesigned its Frontier pickup in so long it should be facing child abandonment charges, but the segment’s previous shabby chic offering, Ford’s Ranger, will soon be with us again, albeit much larger, thoroughly modernized and no doubt capable of taking on the top three. 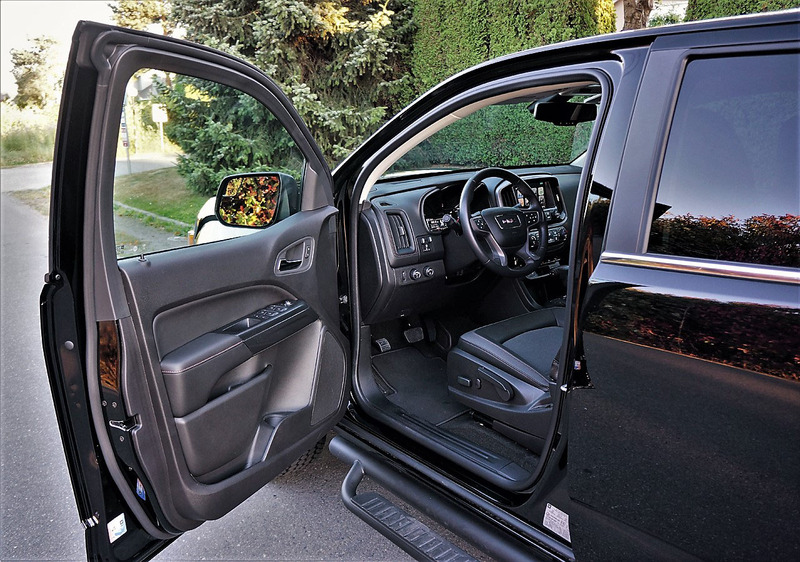 What’s more, FCA, the parent company of the Dodge brand that gave up on the Dakota, finally showed the new Wrangler-based Gladiator in production trim at the LA auto show, so this warming small truck market might soon be boiling over. 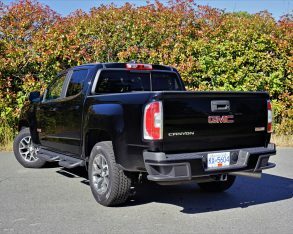 Again, we can thank GM for sticking its neck out with the Colorado and Canyon, because if it weren’t for these two the others wouldn’t have had verified proof that mid-size trucks were still worth investing in, only that buyers were waiting for some decent product to arrive. Decent is an understatement with respect to the Colorado and Canyon, mind you. 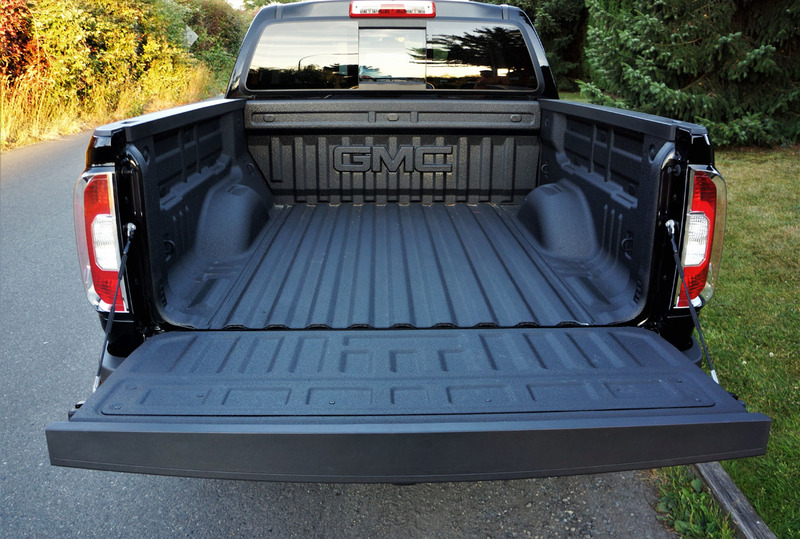 Just look at this GMC Canyon in its 4WD Crew Cab SLE All Terrain setup. 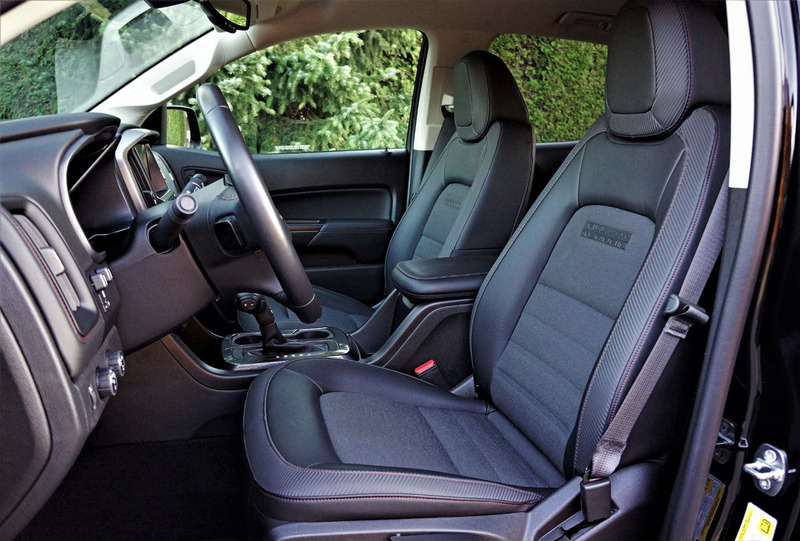 I think its design is fabulous, and I always enjoy spending time behind the wheel, especially when its class-exclusive turbo-diesel four-cylinder powerplant is powering all four wheels. 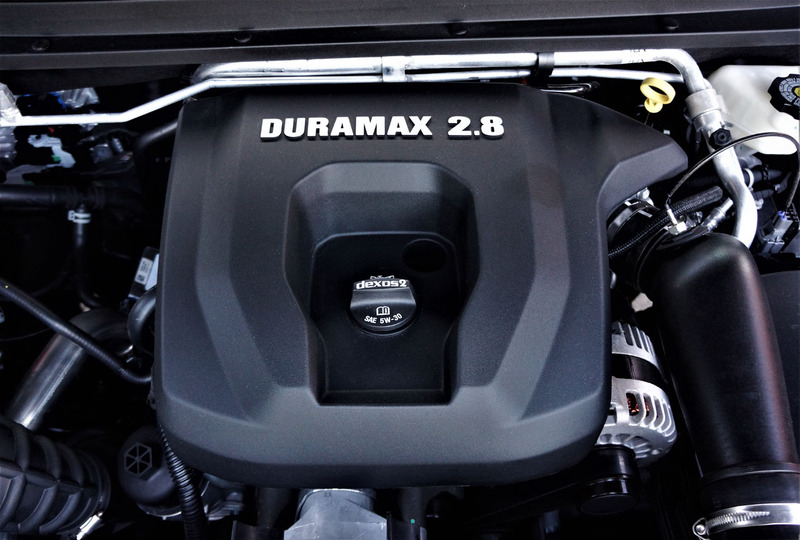 Honestly, this is the type of engine Toyota should be putting into its Tacoma, not to mention Ford and Nissan whenever replacements to their pickups arrive. 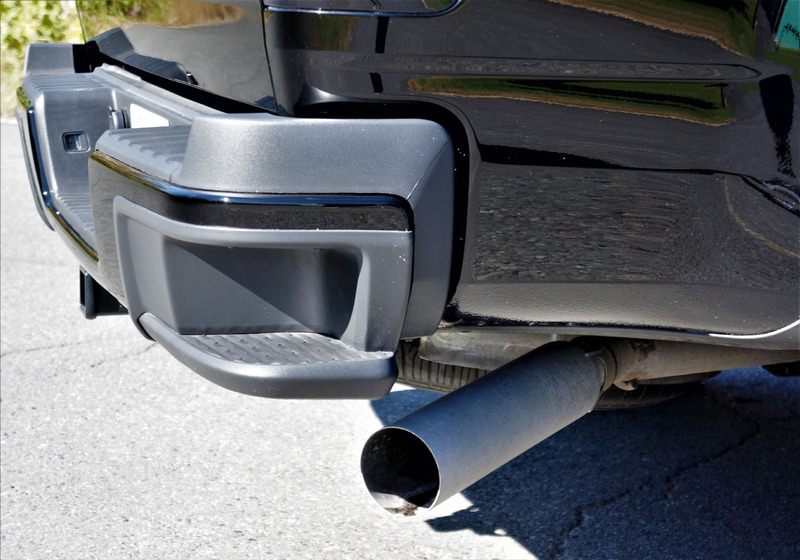 I spend a lot of time in and around Metro Manila, Philippines, my second home (Antipolo City to be exact), and have witnessed all the diesel trucks on offer. 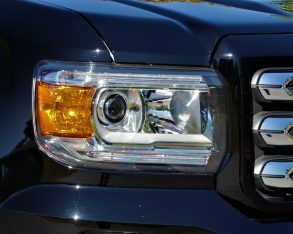 The Ford Ranger mentioned earlier is easily one of the best looking pickups there or anywhere, also diesel powered, whereas the Asian-spec Navara is the truck Nissan should’ve imported to North America along with its fuel-efficient turbo-diesel powerplant. 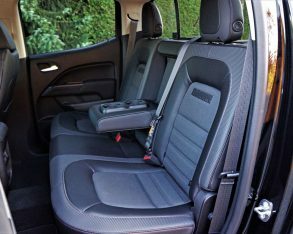 The Philippine-market Toyota pickup is dubbed Hilux and diesel-powered as well, while Chevy also sells a diesel-powered Colorado in the Philippines, although the rebadged Isuzu D-Max isn’t even close to North America’s Colorado. 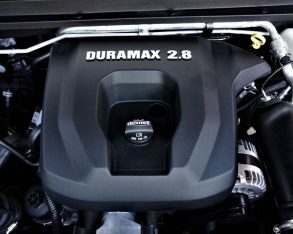 Duramax Diesel power is the first reason I’d recommend our Canadian-spec Canyon or Colorado to truck buyers here, even over the Tacoma. 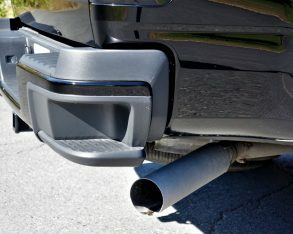 Some Canadians might pretend that fuel economy isn’t as big an issue now as it was before the oil crash, but a quick study of our current economic situation will show that it’s even more important to find economical transportation now than it was then, especially in a smaller, less-expensive pickup class that’s likely being purchased for financial reasons first and foremost. Only this past summer regular 97 octane rose to more than $1.60 per litre in my part of the country, and even our current $1.30 to $1.40 per litre range isn’t exactly cheap. 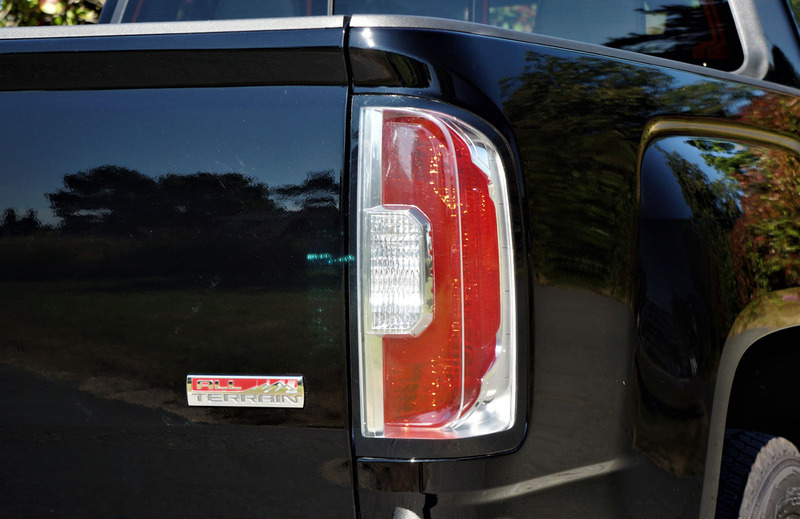 In fact, our new low is considerably higher than just before the bottom fell out of big oil. What’s more, the majority of Canadians should be well aware how these low oil prices hit our collective Canadian gross domestic product (GDP) bottom line, not to mention the wallets of many Canadians’ personally, plenty which come from parts of the country where pickup trucks are a larger percentage of the market, such as Alberta, so it’s probably not a good time to be loose and easy with our fuel budgets. 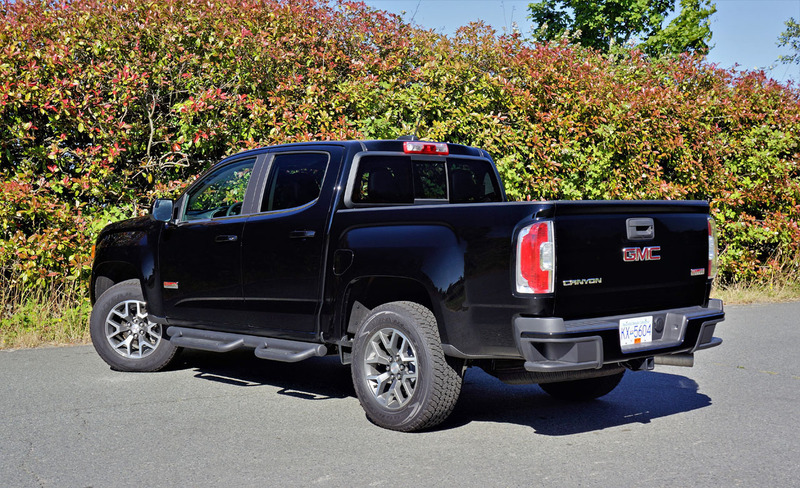 As for where the Canyon and Colorado fit within the overall scheme of things, let’s face the fact that most truck buyers would rather own a full-size Sierra or Silverado than anything mid-size. 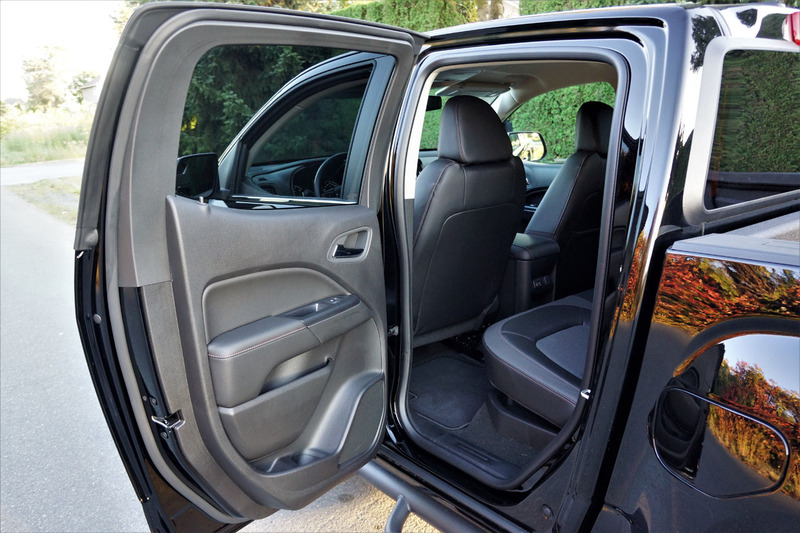 Bigger trucks deliver more space, comfort, performance and functionality, albeit at a higher price. 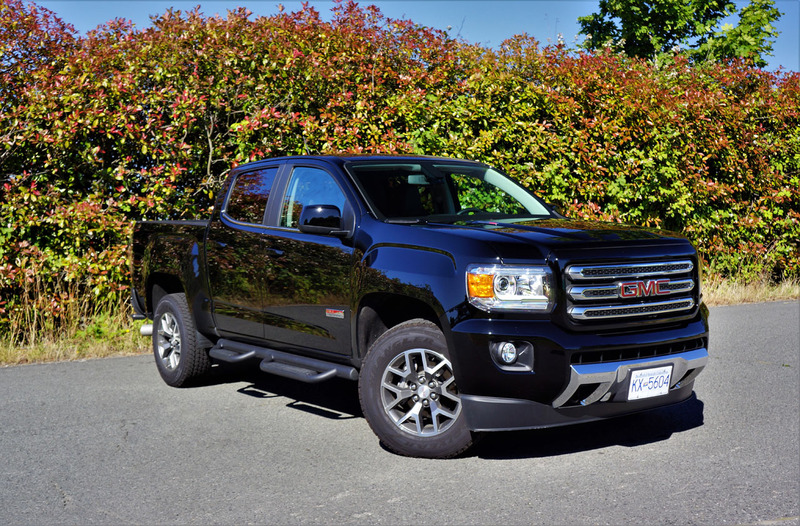 This need to target entry-level pickup buyers is exactly why the smaller Colorado and Canyon exist, but before I go on let’s make sure we’re both perfectly clear about why these two trucks are succeeding in a market segment where others have failed miserably: they’re sensational. 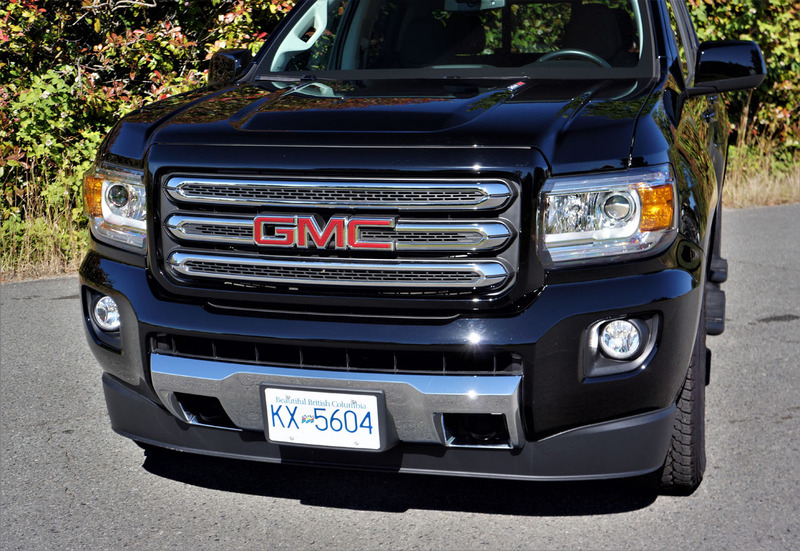 I can’t speak for anyone else, but as noted a moment ago I happen to think both trucks look great. 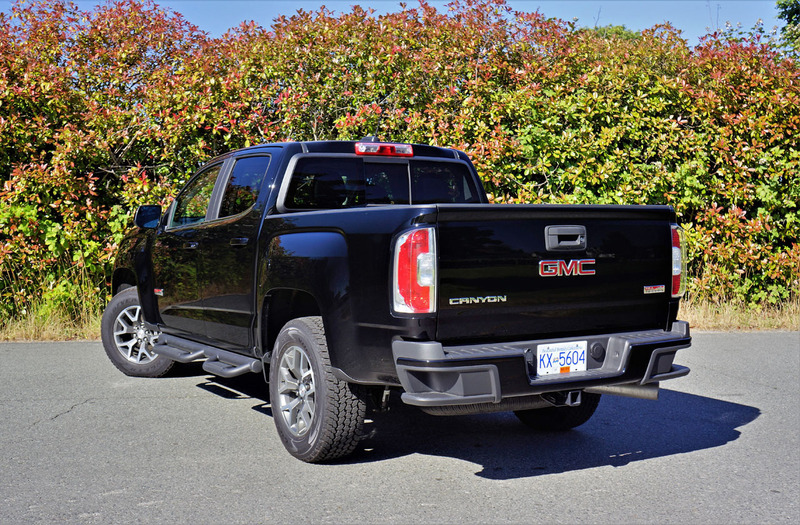 I’m a bit more partial to the Canyon than the Colorado, unless the latter is upgraded to new ZR2 off-road race truck spec. 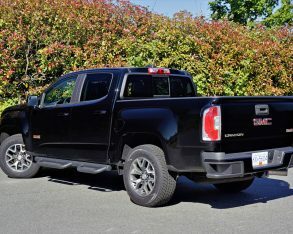 Interestingly, styling matters at least as much amongst pickup truck owners as sports car zealots, buyers in this most utile of auto sectors wooed by rugged designs that appear like they could trek across seemingly impassable terrain as if they were domesticated equivalents of an M1A2 Abrams tank, or in the case of this smaller pickup something along the lines of the now-discontinued M551 Sheridan. 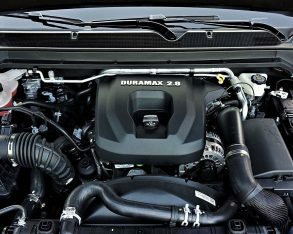 Adding an oil-burning variant only ups their go-anywhere character, the 2.8-litre Duramax turbo-diesel under my 2018 Canyon 4WD Crew Cab SLE All Terrain tester’s sculpted hood capable of a stump-pulling 369 lb-ft of torque from just 2,000 rpm, not to mention a very efficient 12.1 L/100km in the city, 8.3 on the highway and 10.4 combined when configured for 4WD, or an even more impressive 10.8 city, 8.0 highway and 9.6 combined with RWD. 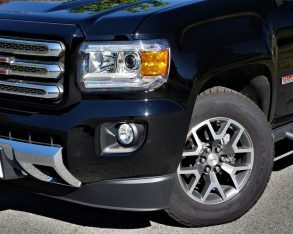 By the way, it makes 181 horsepower at 3,400 rpm too, but that number isn’t quite as important in pickup truck circles, where useable towing twist is king for some and the ability to delve deeper into the wilderness on a single tank of fuel reigns supreme for others. 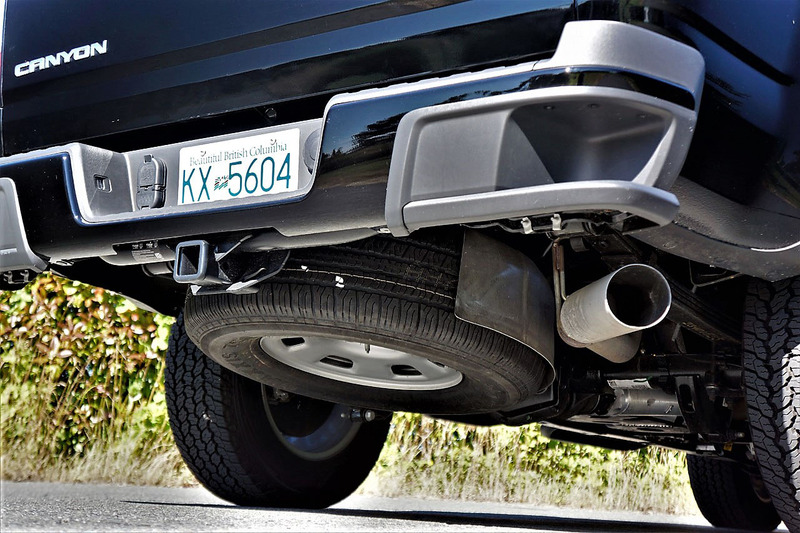 The Canyon’s tow rating ranges from 2,449 to 2,812 kg kilos (5,400 to 6,200 lbs), while diesel models are equipped with an exhaust brake and an integrated trailer brake controller. 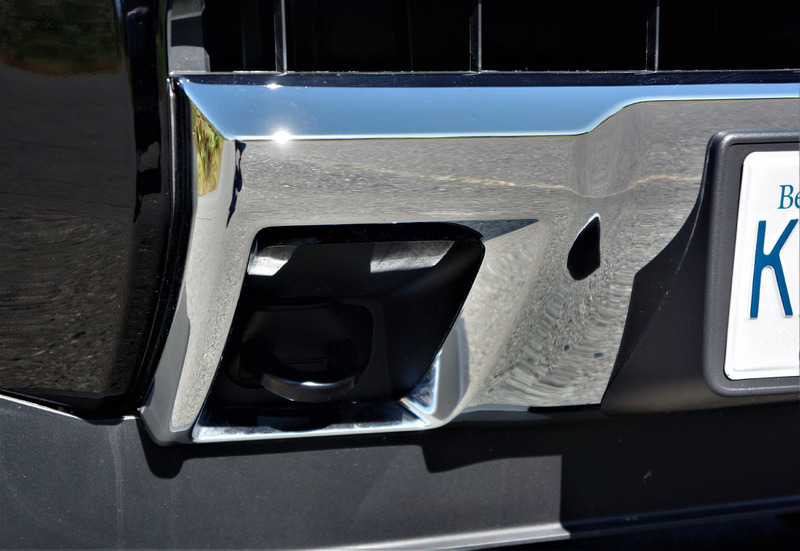 Additionally, SLE trim gets trailering assist guidelines added to the otherwise standard backup camera, plus a Tow/Haul mode that raises transmission upshift points for more power when needed, and also raises downshift points so you can use the engine for compression braking. 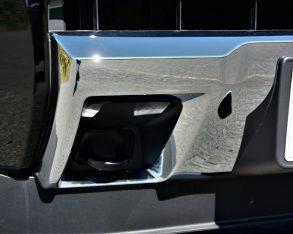 What’s more, an optional Trailering Package adds an automatic locking rear differential, a 50.8-mm receiver hitch, four- and seven-pin connectors, a seven-wire harness with independent fused trailering circuits, a seven-way sealed connector to hook up parking lamps, backup lamps, right and left turn signals, an electric brake lead, a battery and a ground. 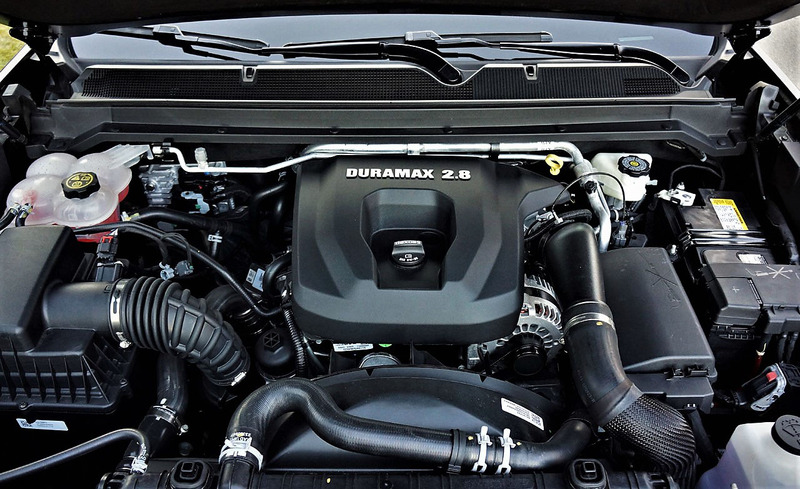 All of that aforementioned torque sounds like it should make for blistering performance off the line, and while the diesel-powered Canyon 4×4 initially jumps forward with enthusiasm it’s not capable of spine tingling acceleration after that. Still, it’s hardly embarrassing on a highway onramp, moves fast enough to get you into trouble in the city or on the highway if you’re not paying attention, and is more than capable of passing motorhomes and big highway trucks when required. 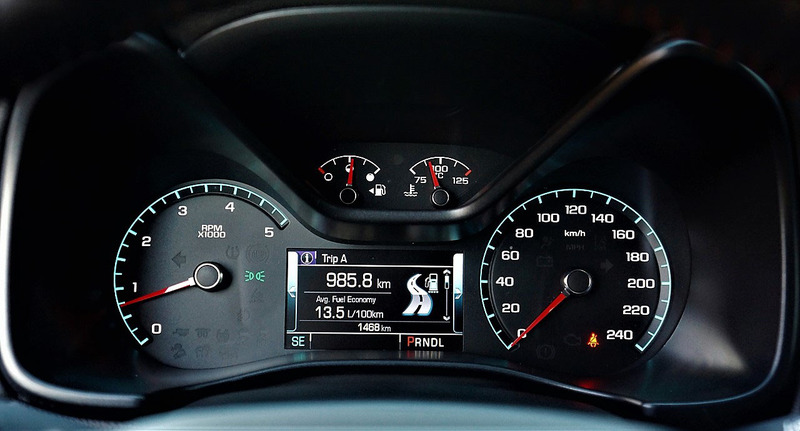 The diesel’s standard six-speed automatic downshifts quickly and is plenty smooth as well, but it could use with another gear or two on its way up to higher speeds. 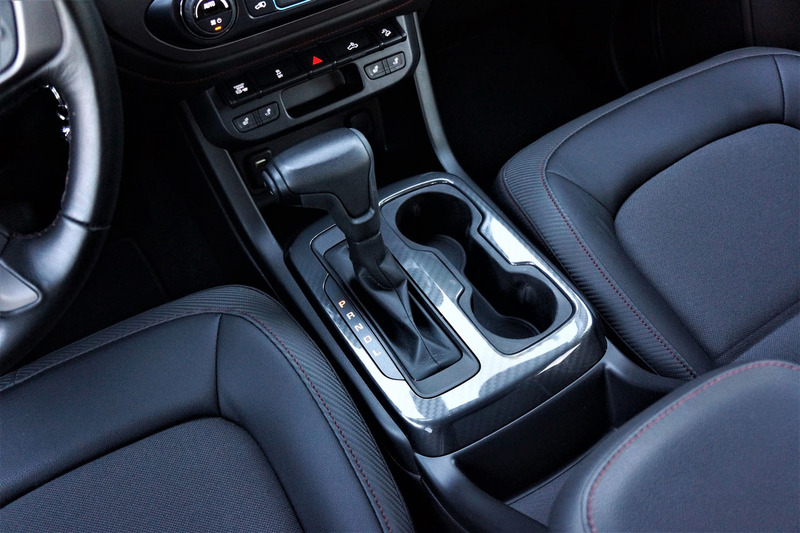 When off-road, shifting into 4WD high or low is as easy as possible, only taking the twist of a rotating knob next to the driver’s left knee. 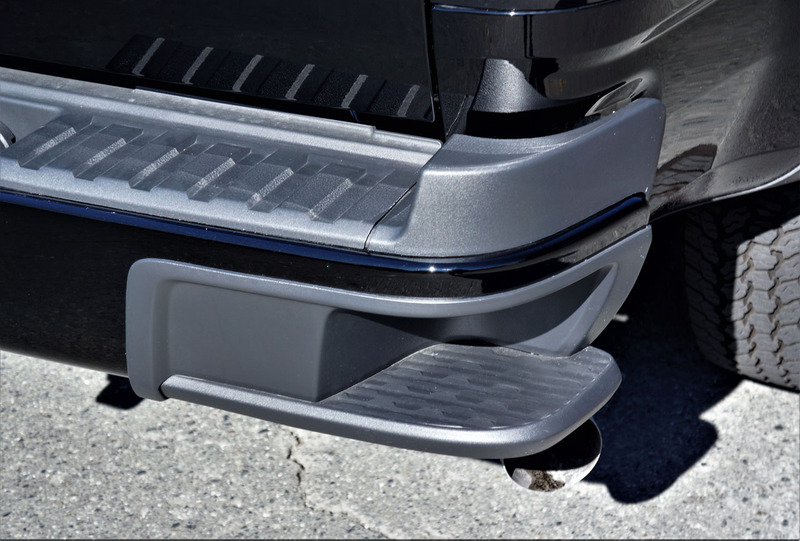 It’s a fully automated system, not forcing you to get out and lock the hubs, of course, but also not requiring a secondary lever to engage its low gear set, while crawling over rough terrain is this little truck’s forte. 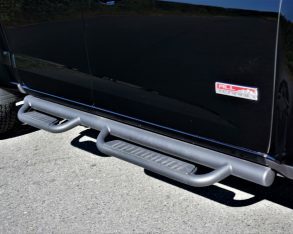 As you might expect by looking at its beefy suspension, my tester’s ride was firm when rock crawling as well as when bouncing down inner-city lanes, but it was hardly punishing. 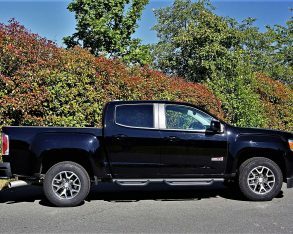 A larger truck like the Sierra offers more compliance due to its heavier weight, but certainly this smaller 4×4 was pleasant enough. 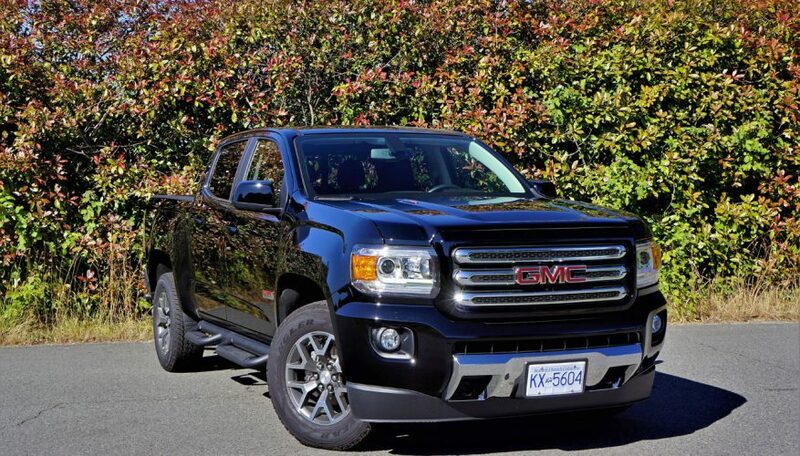 Likewise, handling and high-speed stability is good for the class, with the Canyon fully capable when the road starts to wind and an enjoyable highway cruiser, but once again the larger Sierra delivers more in this respect. 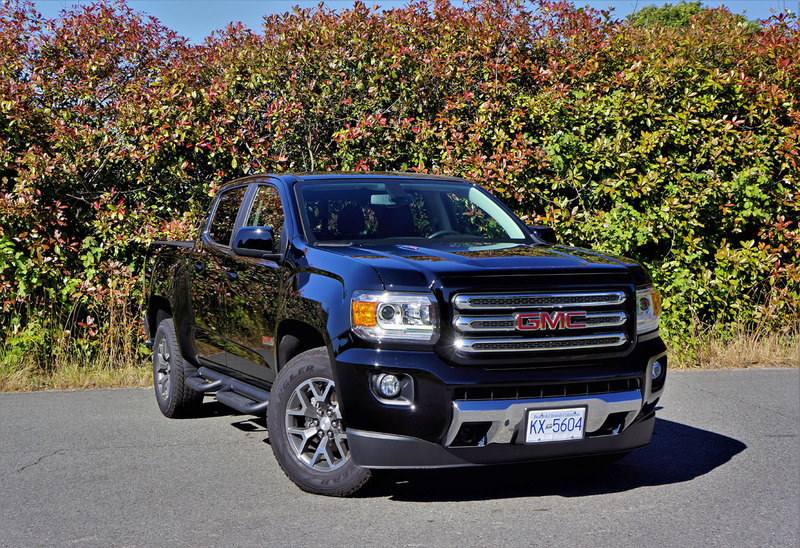 The Canyon’s leisurely pace makes it all the easier to enjoy its impressive cabin, and it really is quantum leap above anything GM offered in this class before, and even a step above most competitors. 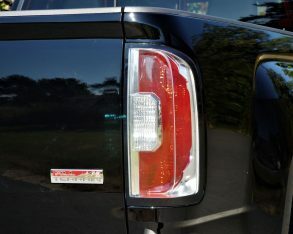 SLE trim offers a mix of premium-level soft-touch surfaces and harder plastics, the latter common in pickup trucks, while the softer detailing includes an upscale padded leatherette with red stitching covering the left and right sides of the dash top as well as much of the instrument panel, whereas the lower dash and door panels are made from the more durable hard stuff. 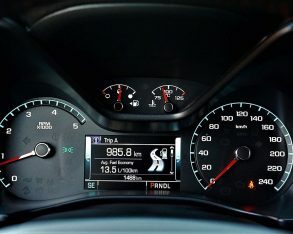 Ahead of the driver, a digital and analogue gauge cluster features a fairly large 4.2-inch full-colour TFT multi-information display at centre that’s filled with useful features and superb graphics, while over on the centre stack is GMC’s new IntelliLink infotainment interface, which has become one of the best in the mainstream volume sector. 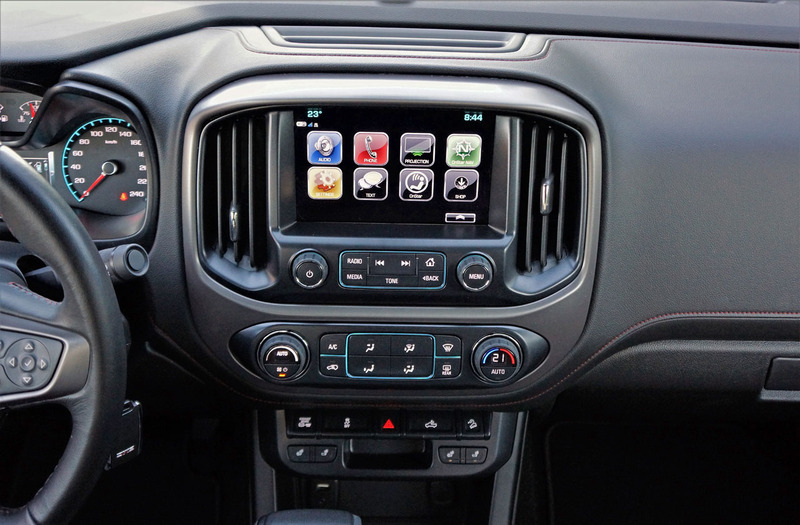 It’s upgraded to the Canyon’s larger 8.0-inch touchscreen in SLE trim, and is easy to operate thanks to nice big ovoid Apple iPhone-style candy drop buttons in various bright colours and the ability to use tablet-style tap, pinch and swipe finger gestures. 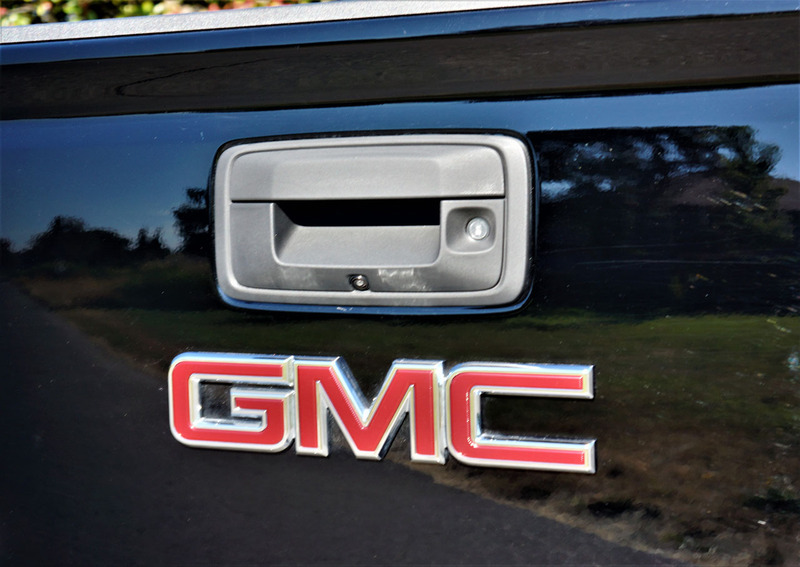 This test truck didn’t include optional navigation with detailed mapping, but GMC includes the very useful OnStar turn-by-turn route guidance system, while the SLE’s infotainment interface was also loaded up with standard Apple CarPlay and Android Auto smartphone connectivity (although these are even included on the base model’s now larger 7.0-inch infotainment display this year), a decent audio system featuring satellite radio and Bluetooth streaming (a Bose system is optional), text messaging, and of course plenty of car settings. 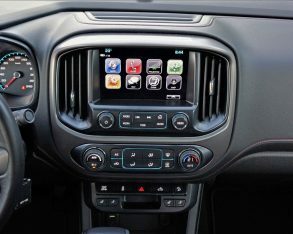 Some buttons below the touchscreen allow quick access to radio, media and audio functions, plus the home screen, while a nicely sorted single-zone automatic climate control interface is set up in the old school button and knob style just below. 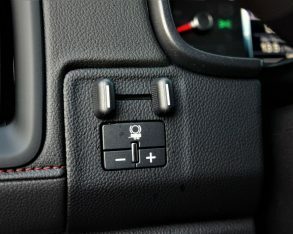 On that note, switchgear for GM’s excellent heatable seats can be found just under the HVAC system on a separate interface, these being especially good because they allow the ability to heat both lower and backrest cushions separately, or just the backrest alone, while just above these is a row of toggle switches for trailering, turning off the stability control, the bed light, hill descent control, and the hazard lights. 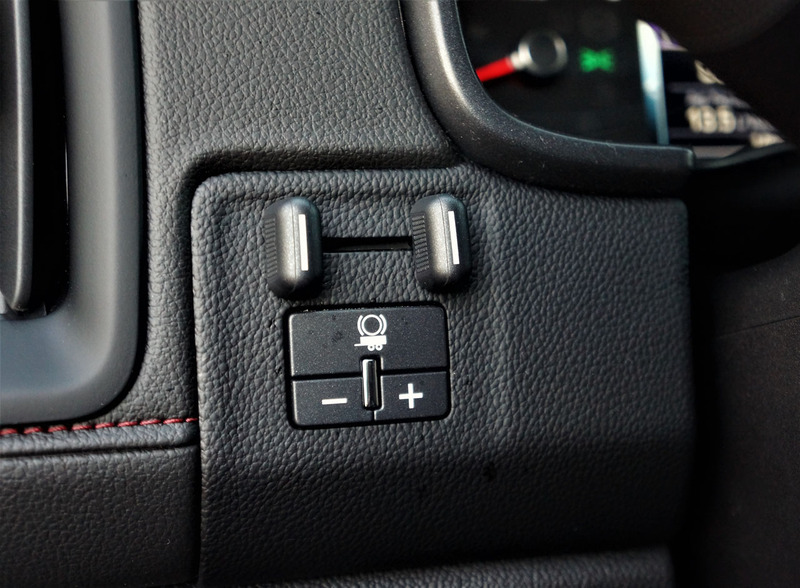 A traditional lever gets used for shifting gears, with a plus/minus rocker switch on the knob for rowing through the cogs manually with your thumb. 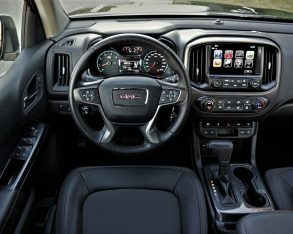 This means no paddle shifters are included, which is the case for most pickup trucks, but the steering wheel is nevertheless a nice sporty design with leather around the rim and more red stitching, while the switchgear on each spoke is very nice with rubberized buttons. 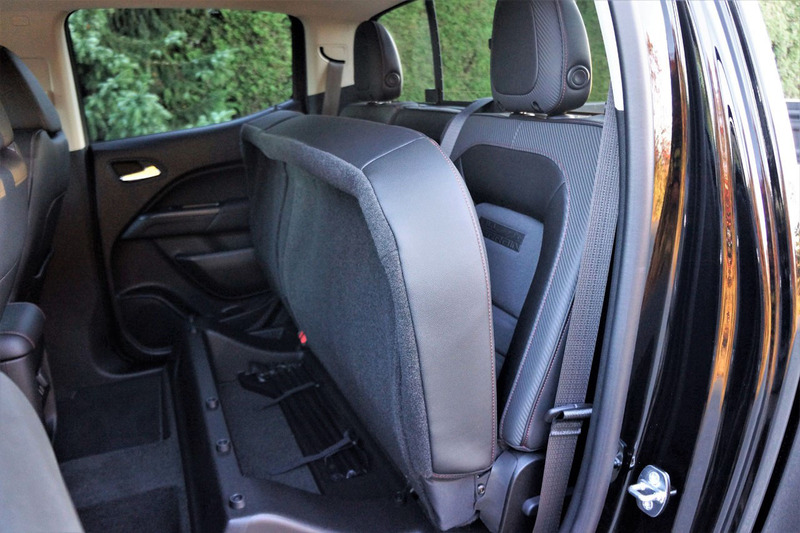 The column is tilt and telescopic as well, whereas the seats are powered with fore/aft, up/down, and two-way powered lumbar support adjustments. 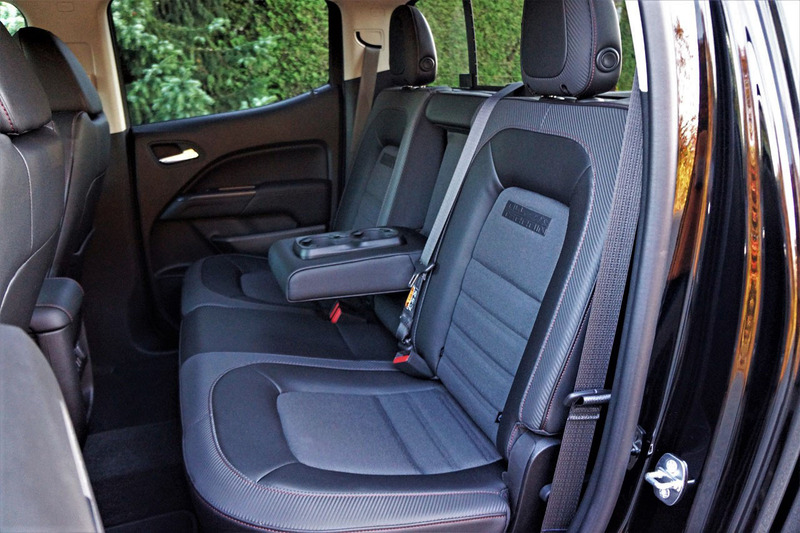 Only the backrest needs manual actuation, which didn’t make one difference to me over my weeklong test. 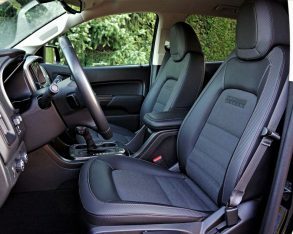 The upgraded upholstery features both smooth and textured leatherette around the edges with a comfortable cloth in the centre, plus “ALL TERRAIN” combined with a mountain graphic stamped on the backrests. Considering SLE is hardly top of the line, it’s all pretty impressive. 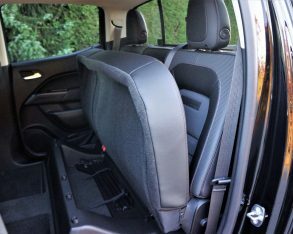 The rear bench seat gets the same styling high-level treatment, and the outboard positions are quite comfortable other than having somewhat upright backrests due to space limitations. 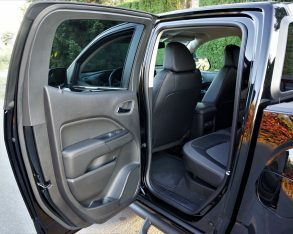 When the driver’s seat was set for my five-foot-eight frame I had about five inches available ahead of my knees when seated behind, so limousine-like wouldn’t be the term I’d use to describe the Canyon Crew Cab’s roominess, but most should still find it spacious enough, especially for this class. 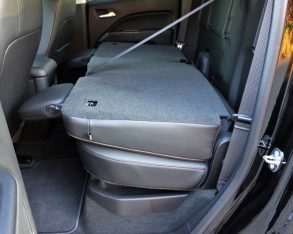 The rear seatback can also be flattened for a handy load surface, or alternatively you can pull up the lower bench for stowing taller cargo you might want to keep out of the bed behind to protect from weather or theft, while lifting the seat also allows access to things stored underneath. 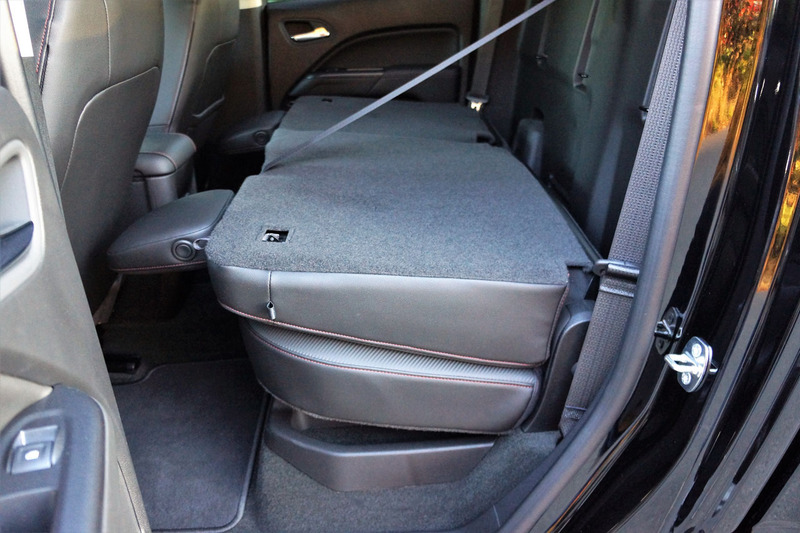 I only wish GM had split the seat 60/40 for more passenger/cargo flexibility, but it’s hardly a deal-killer. 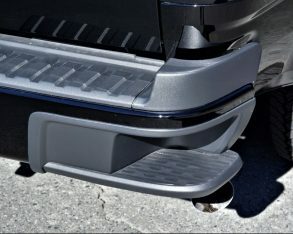 A deal-maker, and perhaps a pickup truck game-changer that I absolutely must highlight, is the CornerStep-infused rear bumper, an intelligent design that adds handy toe cutouts to the corners of the back bumper to ease smaller statured and/or maturing folk up onto the cargo bed with more grace and less potential bodily harm, the latter especially relevant when wet weather transforms the otherwise tiny rounded nubs at each corner of every competitive truck’s rear bumper into a slippery accident waiting to happen. 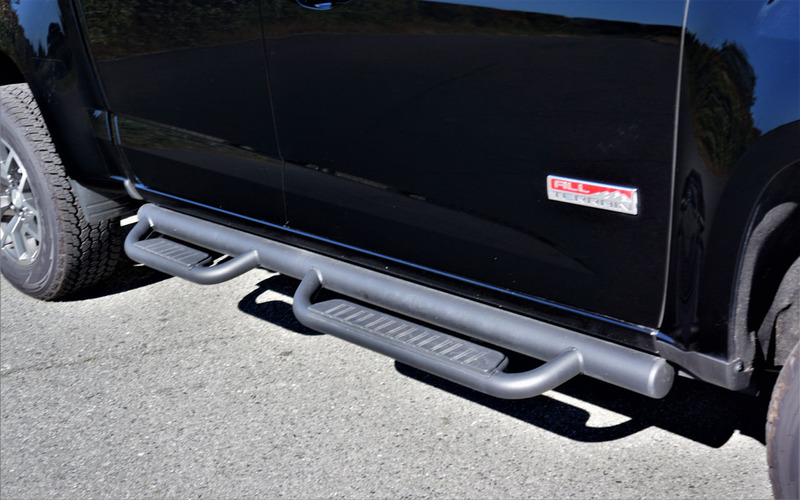 I love these, and really appreciated how easy this makes it for climbing onto the bed when the tailgate is lowered. 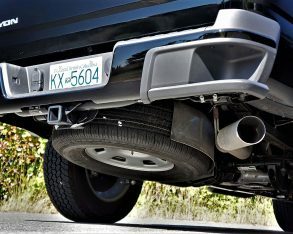 Now that I’m talking features I’m realizing that I’ve neglected to go into detail regarding my tester’s standard kit, so over and above the equipment I’ve already mentioned my diesel-powered Canyon 4WD Crew Cab SLE All Terrain was nicely outfitted with 17-inch alloys, a Z71 off-road suspension, skid plates, body-colour bumpers, side steps, remote start, four USB ports, OnStar 4G LTE and Wi-Fi, a sliding rear window, a tow package, and more for an as-tested price of $47,988 plus freight and fees. 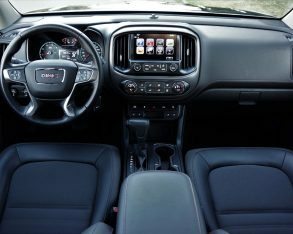 Of note, the base Canyon starts at just $23,310, but you can spend considerably more than my tester’s nicely equipped tally for a fully loaded version, especially if venturing into top-line Denali trim (to see all 2018 GMC Canyon trims, packages and options, plus rebate info and dealer invoice pricing that could save you thousands, visit CarCostCanada now). There’s a lot more I could say, but maybe it’s best to leave something special for you to personally discover. 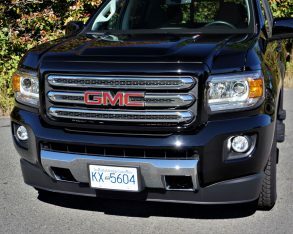 The Canyon is an impressive truck, and totally worthy of all the attention it’s getting from its ever increasing fan base. 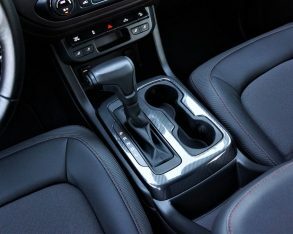 I recommend the turbo-diesel, but the base Canyon comes with what on paper seems like a reasonably strong 200 horsepower 2.5-litre four-cylinder and six-speed automatic combo, while upper trims can be had with a formidable 308 horsepower 3.6-litre V6 mated to an advanced eight-speed automatic. 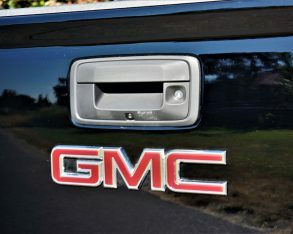 I’ve tested the latter and really enjoyed the extra power and smooth shifting gearbox, but in the end you’ll need to figure out which powertrain, transmission, driveline setup, body style and trim level you need for yourself, because GMC offers myriad options. 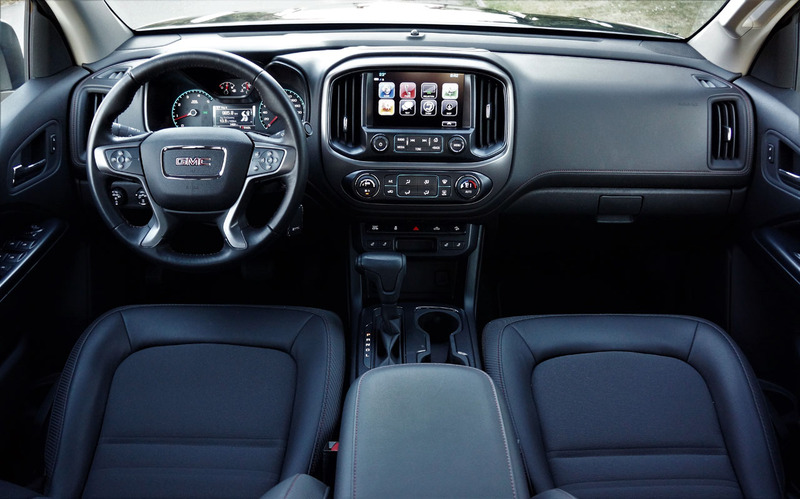 This ability to fully personalize your ride really sets the Canyon, and its Colorado sibling apart from any rival, its three distinct engine options at the heart and core of this philosophy. 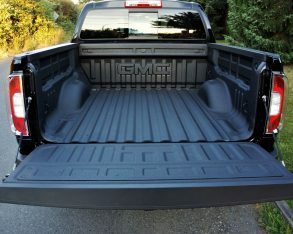 More really is better, and GMC offers the most. Enough said.